We get it: sometimes you just need to get outdoors. After all, the sun is beckoning, and if last winter taught us anything, it won't be here forever. Follow that warm weather-chasing urge straight to summer fitness at some of New York City's top outdoor classes! From yoga to running and boot camp to tennis, here are 12 ways to add some Vitamin D to your next sweat sesh. With over 20 years of creating innovative fitness programs, Roy Alexander takes his boot camp outside with Alexander FITCampNYC. Bring your own mat, sneakers, and water, and get ready to sweat. Join a fun, fearless group of likeminded fitness adventurers, and get your sweat on with a view with locations on the Brooklyn Bridge, Prospect Park and Central Park. Using your own body weight as resistance to sculpt, tone, and blast calories in the great outdoors with Brooklyn Bridge Boot Camp. Bring your own mat and towel to Circuit of Change, a killer mind-body outdoor bootcamp. Using elements of yoga, martial arts, core fusion, gymnastics, and meditation, burn calories, tone and sculpt your entire body, while finding peace of mind through movement. Torque Cycle + Strength takes its classes into its own backyard for the summer. 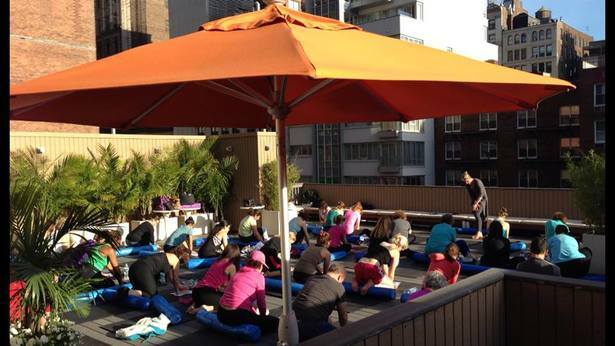 Enjoy yoga and boot camp classes on Torque's gorgeous deck. Upgrade that jog in Central Park to a full-fledged boutique fitness class with Train P3. Train P3 is a multimodal, movement based, strength and conditioning method - not a boot camp - that focuses on skills and good form. Connect with your mind, body, and nature during Anthea Yoga's outdoor summer flows. The quiet patio offers a serene setting for a naturalist yogi's practice. Start or end your day with outdoor fitness! Hit up the rooftop of CLAY Health Club for Vinyasa classes with a view on Wednesday mornings at 7:00 AM and Thursday evenings at 6:30 PM. Don't worry, runners: we haven't forgotten about your favorite outdoor exercise! Join an expert coach at Fitness Runs for HIIT (High Intensity Interval Training) in 30-minute or 60-minute group cardio sessions. 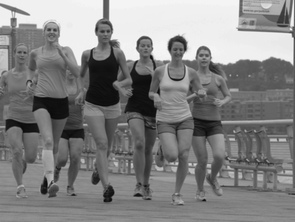 Beat the Monday blues with conbody's Monday Run Day! Take your run game to the next level with this weekly run club. Tangerine Hot Power Yoga takes a break from its flow to hit the pavement with a weekly run club. Join yogi and marathon runner Amanda Kerpius for her weekly run club Tuesdays at 7:00 PM (and stay after for the 8:00 PM yoga, if you are extra motivated!). Whether you're in Manhattan, Brooklyn, or Queens, there is a net waiting for you with Bumble Bee Tennis. Learn the game or practice your skills with the Beginner, Intermediate and Advanced Level Classes.